Fallkniven have a habit of coming out with incredibly unique knives and the U1 is really no exception. 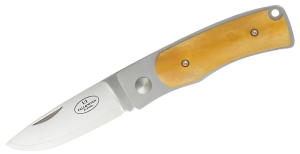 And as with all Fallkniven knives, the U1 combines the use of highly advanced technology together with fine craftsmanship that comes from centuries of knife making traditions. What really makes the U1 stand out from all the rest of the knives on the market is its mechanism that is based on the slip joint method and which is now also legal in several European countries and which also includes the United Kingdom. A word or two about the steel used in the U1 would not go amiss. This is the world famous and legendary 3G steel which is a laminated powder steel and which is practically beyond comparison for sharpness. You also find nail grooves on the blade which enables a left hand or a right handed user to make good use of the knife. 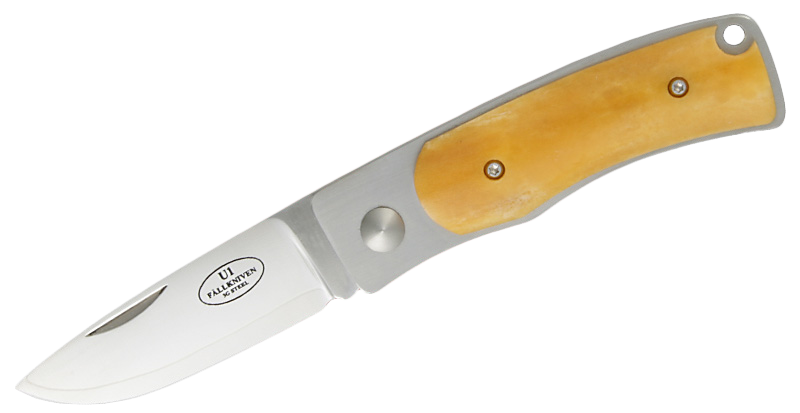 The handle is made from yellow bone ochre which continues to add class to this king of knives. The U1 has a closed length of 3.38 inches or 86mm and a blade length of 2.44 inches or 62mm. With a blade thickness of 2,5mm it is ensured that the knife will cut through almost every material while the hardness of 62HRC confirms its incredible and virile strength in all departments. At 76 grammes it is quite lightweight for its size and this also ensures that it is not heavy or cumbersome to use. The U1 also comes in a Balck cordura pouch which ensures that it is kept protected at all times. The U1 is a knife which can be used for most tasks and is particularly useful for everyday activities.